It is divided into independent branches, through which the current flows with partial intensity (in a series circuit, all the elements receive the same intensity). Part of the circuit between two consecutive nodes; it constitutes an independent electric circuit. Polarity element of the battery from which the current flows through the circuit. Polarity element of the battery toward which the current flows through the circuit. Electrons move from the negative terminal toward the positive terminal; this is opposite to the conventional direction of the current, which flows from the positive toward the negative. Junction point of two or more branches in the electric circuit. It enables each device to have its own circuit and to function independently. This way, if one lightbulb does not function, the current continues to flow in the rest of the circuit. Gas sealed in a glass envelope into which the luminous body of a lamp is inserted. Devices that transform chemical energy into electric energy in order to power electric devices (here, a lightbulb). Device composed of one or more interrelated cells; each one accumulates a reserve of electricity whose purpose is to supply electricity to the circuit. The current leaves the battery by the negative terminal, flows through the circuit to power the lightbulbs and returns to the battery by the positive terminal. 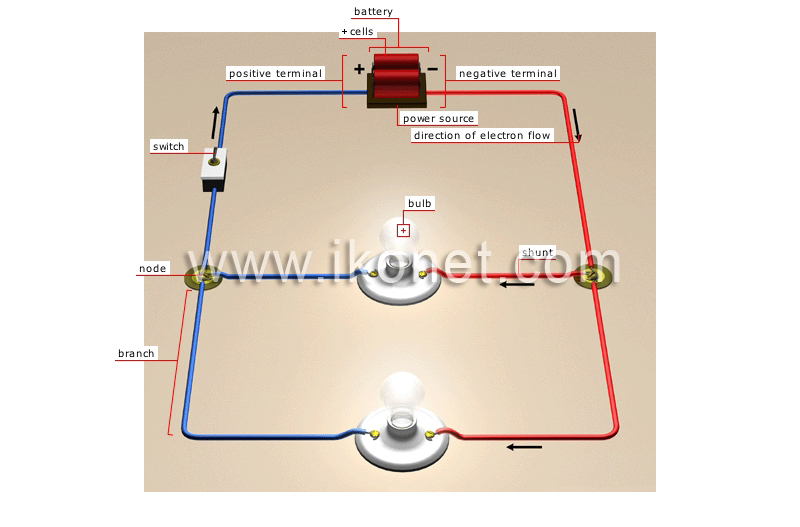 Mechanism allowing the current in an electric circuit to be established or interrupted.